Think back a generation and it was hard to imagine NBC being the number 6 broadcast network. At that point there weren’t even six major broadcast networks. Today, NBC has dropped about as low as it’s possible to drop, and with TV viewership continuing to fall due to internet viewing, it’s enough to make traditional broadcasters nervous. 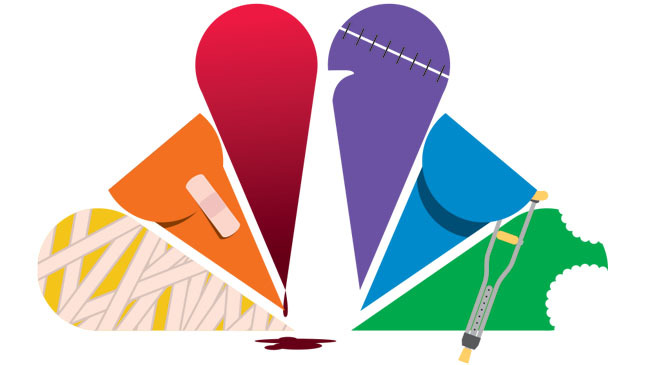 NBC has enjoyed precious little success in the last decade after a long string of bad decisions in the 90s and 2000s left them with little development money and a poor selection of programs. While they do well in Olympics years (of which this is one, in case you’ve forgotten, they basically tank any time they’re not running Olympics or The Voice, the network’s one noteworthy hit in the entirety of the 2010s. The Hollywood Reporter tells us that NBC knows they’ve messed up and they’re trying to fix things. They sent out NBC Entertainment president Jennifer Salke to speak at an industry panel and Ms. Salke was surprisingly candid about what went wrong at the once-indomitable peacock network. She admitted the network made a lot of missteps, including canceling shows too quickly, developing shows that weren’t smart enough, and looking for cash cows instead of looking for good programming. Well, if nothing else, I agree with her. Now it’s a matter of coming up with something new that actually works. THR also has a slideshow of upcoming programs and I have to tell you, most won’t get a single viewing from me. It’s not just NBC, by the way. The entirety of broadcast television seems to have lost its way, piling on cop and lawyer shows so generic that they’re known only by the city in which they take place. They’ve added a heaping helping of even more crime shows, but based on movies or other TV shows. Finally, they’ve dipped into true banality with a few shows, not the least of which is “Son of Zorn” about an animated character who tries to reconnect with his non-animated son. Who gave the thumbs up to that one? I continue to be largely disgusted by the sheer number of copycat shows out there and the fact that the few shows that aren’t copycats are, to be frank, just stupid. It’s amazing to me that cable continues to turn out some real quality TV while broadcast just can’t. NBC’s Salke can’t even blame the censors; she admits that standards are far more relaxed now. So where’s the good stuff? Where’s the programming that isn’t just a cop show with a twist? I’ll admit that it must be hard to be a broadcast executive these days. I’m sure there are mornings you wake up and you can literally see armageddon on the horizon. But I am actually quite bullish about broadcast TV, although a big shakeup is coming. The days of unlimited budgets and 18 minutes per hour of commercials are ending, but there’s an opportunity out there for broadcast to reinvent itself the same way radio and movies reinvented themselves in the late 20th century. It’s hard to imagine, but both radio and movies were left for dead when television came on the scene, and both burst forth with a level of creativity that fueled their rise throughout the next fifty years. Radio’s having some tough times as well now, but there’s still life in both radio and broadcast TV. It just takes some people to think about them in new ways. NBC has taken the first step in admitting publicly that it has a problem and that mistakes were made. Now they just have to step back and think really hard about the kind of programming service they want to be. Laziness won’t cut it in the 21st century, and neither will C-list celebrities trudging through the muddy tropics. It’s time for something so new that no one’s thought of it yet, and believe it or not NBC is actually well-equipped to find it. Just please, don’t let it be a show about a time-traveling cop who’s also a father to a mentally challenged kid, starring JB Smoove. Oh heck, now I gave them an idea. Great.